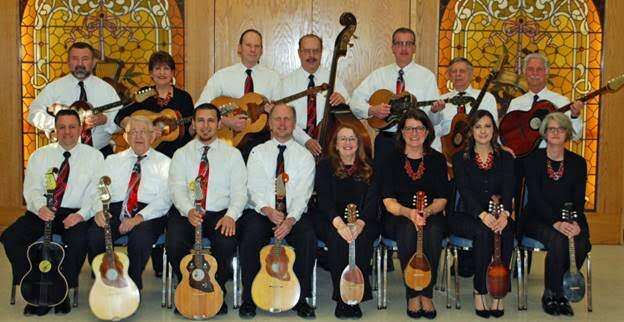 We invite you to an evening of fine music and celebration with the Detroit Tamburitza Orchestra. The performance will begin at 6:30 pm on Saturday, April 27, at the Michigan Collegiate High School at 31300 Ryan Road. Reception will follow at the Zora Lodge 351 Croatian Club just minutes north of the high school. Concert and/or the reception dance is one combo price of $15 for those 13 & older; children 12 & under are free. Frankie Corak and his All Star Band will be providing the evening’s entertainment. We encourage you to purchase your tickets in advance from any DTO member. Tickets may also be purchased at the door. Doors will open at 5:45 pm for the concert. Food and refreshments will be available to purchase at the club after the concert. Directed and conducted for the past five years by Frank Corak, our DTO repertoire ranges from traditional and folk Croatian and Balkan music, to some of the world’s most famous classical composers. Frank has written several of his own melodies, and arranged many of our songs for the tamburitza. Our featured soloists will be our own Danijel Majhan and Joanne Karen Mahoney. Joanne returns to the stage to reprise a crowd favorite, Moj Dilbere, from when she was a soloist in the mid-seventies with the Star Junior Tamburitzans. We hope to continue the rich traditions of DTO for many years to come, and welcome all musicians to consider joining our group in the fall of 2019. Many of our members came through the ranks of the Star Junior Tamburitzans and have been playing together for years. Others decided it was the just right time given an empty nest, or were coerced by various means or circumstances. Any way you find us, our Wednesday night practices at Croatian Club are filled with laughter and the love of music. We travelled this past fall with Nova Nada to the Adult TamFest in Pittsburgh, and the season also included performances at Christmas in Croatia, DTO Kolo Night and Cro Fest. Come join us!